Before you go off to college this summer, I wanted to make sure to tell you a story that I have rarely, if ever, told with total honesty. First of all, I am so excited for you to start your college journey; my freshman year of college was the most formative year of my life, I was faced with a continuous stream of choices that lead me to discover more of who I am and where I wanted to go. These choices shaped my perception of myself and the world around me. As a college freshman I have no doubt that you will hear about the infamous “freshman fifteen”; it’s the age old ‘horror’ story of the cute skinny girl moving out on her own and binging on school cafeteria cookies until finally those cookies form a solid fifteen pounds that seem to have miraculously appeared by the time you go home for Christmas break. I should first say that the freshman fifteen is not a myth; it’s true what everyone says, you really can eat as many of those ridiculously tasty cafeteria cookies as you want and no one will stop you. What no one will tell you, however, is that you can stop eating, and no one will stop you. I moved into school with this horror story of the ‘freshman fifteen’ imprinted on the walls of my stomach; it became the filter through which I looked at every one of those ooey-gooey, straight from the oven, cafeteria cookies. I feared the freshman fifteen as if it were an infection disease that I would inevitably catch; to me, those cookies embodied what it meant to be undisciplined and I was positive that being even slightly lenient with myself was the embodiment of a weakness and addiction for food. I saw every single delicious calorie I ate as if it were an entire pound added to my body. Like many women my age, I have deeply struggled with my concept of body image since early middle school. I remember nights where I would poke and prod at my stomach and legs as I cried, angry with God for making me the size that I was. I lived daily with the fear that I would gain more weight, that I would get ‘fat’. My freshman year of college, that fear manifested itself in every bite I took. At the beginning of the year I made the choice to try and maintain my weight, but there was something inside of me that thought this wasn’t enough. I had found that in the freedom of the cafeteria, I could easily control the amount of calories I ate each day without anyone to question it. I slowly lowered the amount of calories I ate each meal, determined finally feel in control of my body. This choice defined who I became for the next year and a half. Every single night I would look in the mirror, poke and prod, and think about how disgusting I was. I hated myself for giving into food and eating that extra snack, or taking that extra bowl of salad. I would step on the scale every morning, angry that I had was not the weight I wanted to be, and promise myself to try harder that day. By night, I would weigh myself again, fruitlessly hoping that I had miraculously lost weight during the day, yet again promising to eat less or work out more the next day. What I hadn’t noticed was that I was actually losing weight. A lot of it, and quickly. Within two months I had lost nearly twenty pounds. And I still didn’t like what I saw in the mirror. What I realized at that point, was that what I hated the most about myself was not my body, but rather the fact that I hated my body. I felt weak for feeling like I wasn’t thin enough, for buying into the world’s idea of beauty. I felt like I had sold out to the idea of the thin beautiful ideal that the world was selling me. I hated myself for that weakness; I hated myself so much for that weakness that I refused to tell anyone how I felt, I wanted to be the strong one and I didn’t want anyone to see me as weak. When I came home for Christmas break I was ashamed of what I had done to my body but I also felt a sick sense of triumph at the fact that I had won the battle with my appetite. When our family members commented on my weight loss I felt an inward sense of pride and shame all at the same time. I knew that I was better than that, but I loved that I was finally being called thin. It got to the point where I was eating so little that I was blacking out three to five times a day. I eventually sought out the school nurse for a blood test, thinking that I was sick. She informed me that I have hypoglycemia, which means that my body processes sugar extremely fast, leaving me with low blood sugar. The nurse recommended that I consult the school nutritionist to understand how to eat in a way that would not leave my blood sugar so low. In my discussion with the school nutritionist I discovered that I was eating only half of what my body actually needed to function properly. This was the first time in six months that I felt confronted by the idea that I had developed an eating disorder. I would not be honest about that until nearly six months after that. Almost two years later I am in a much better place. I no longer feel ashamed of where I was, I no longer feel like I am not thin enough, or like I cannot control myself. I can say with pride that I feel strong and healthy, and believe me, strong and healthy feel so much better than thin and blacking out. I can also say with pride that I eat those cafeteria cookies (they really are quite tasty) frequently. I sit here writing this story for the first time Gracie because I love you dearly, because I know you are stunningly beautiful, and because I need you to know that this dark voice is just waiting for you to give into it and I never want you to listen to those lies. I still have days where I look in the mirror and hear that sickly voice in the back of my head telling me that I am not enough. I am still on my journey toward mental and physical health, but at this point I feel like I have overcome the shame of it and know that I am strong and courageous for fighting against that mentality. So my dear, sweet, beautiful, talented, lovely little sister, please remember that the freshman fifteen doesn’t have to define you. It doesn’t have to be come a part of who you are. Click here for more information on college and eating disorders. 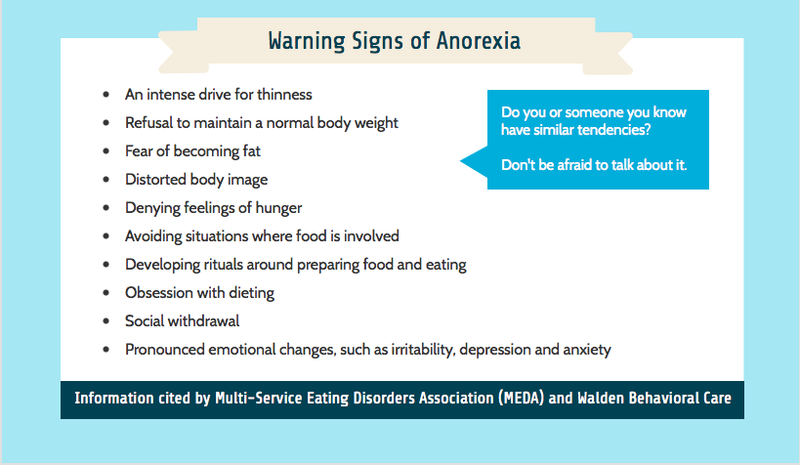 For more information on eating disorders in general, click here.